We can tackle the first three words in another article but for now, let's look at the next few words. In the original Greek, the word "Lord" in the above verse is the word κύριος, transliterated as "Kyrios." This is the same word used in the Septuagint for God. The Septuagint is the Hebrew Old Testament translated into Greek by 70 Jewish scholars hundreds of years before Jesus came down to earth. The word κύριος is used at least 667 times in the New Testament to refer to God (YHWH), but it is also used to refer to "lord" (at least 54 times), "master" (at least 11 times), "sir" (at least 6 times), "Sir" (at least 6 times), and another 4 times for other words. By leaps and bounds, however, it is used most often for YHWH God. Since the word can refer to people other than God, we need to examine the context to determine which definition applies. Take a look at what else Luke's Gospel has recorded for us. The angel had said Messiah was "Christos Kyrios" or more literally, "the Anointed One the Lord." 26 It had been revealed to him by the Holy Spirit that he would not see death before he saw the Lord’s Messiah. The words "the Lord’s Messiah" in the original Greek are transliterated as "christon kyriou" or "the Lord's Anointed One." The two titles are given to the same Person: Jesus. "The Anointed One the Lord" is also "the Lord's Anointed One." If you still aren't getting it, allow me to spell it out for you. 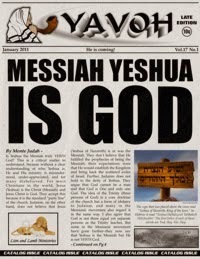 "YHWH's Anointed One Jesus" is "The Anointed One YHWH." Luke 2:11 ... Christ the Lord—"magnificent appellation!" [Bengel]. "This is the only place where these words come together; and I see no way of understanding this "Lord" but as corresponding to the Hebrew Jehovah" [Alford]. in the higher sense it is (as in the LXX.) the equivalent of the Hebrew ‘Jehovah’—the ineffable name. “We preach Christ Jesus the Lord,” 2 Corinthians 4:5 (see Php 2:11; Romans 14:9; 1 Corinthians 8:6; “No one can say that Jesus is the Lord but by the Holy Ghost,” 1 Corinthians 12:3).